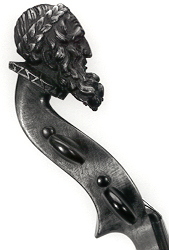 NMM 5914. 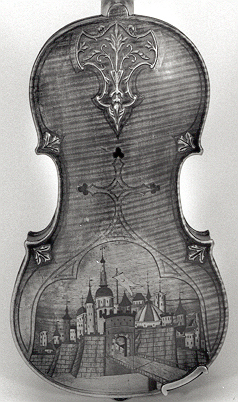 Violin attributed to Honoré Derazey, Mirecourt, France, ca. 1850-1870. 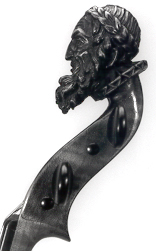 Handwritten paper label in black ink: Gaſpard Duiffopruggar / Boimamellia, Anno 1516. 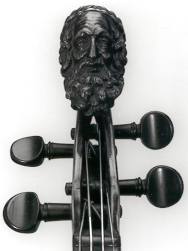 Incised into ribs in large block letters, painted black: upper bass rib: VIVA FVI; lower bass rib: IVI SYLVIS DEO; lower treble rib: VI MORT VA; upper treble rib: DUL CE ╪. Rib inscription an abridgement of the Latin verse, "Viva fui in Sylvis; sum dura occisa securi; Dum vixi, tacui, mortua dulce cano," which translates "I was living in the forest; the cruel ax did slay me. Living, I was mute, Dead, I sweetly sing." Ex coll. : Vladimir Lenski, North Hollywood, California. 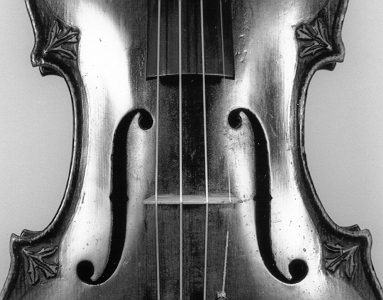 Gift of Kathleen Lenski, Los Angeles, California, 1995. 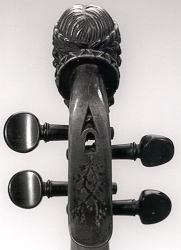 Close-up view of long f-holes; very narrow upper and lower wings; notches minimally offset; inside edges stained black. Spruce, three-lobe oak leaf appliqués on corners of top; maple overlap purfling. 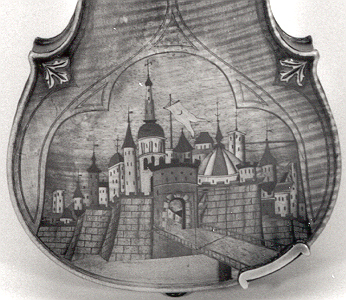 Decoration on back of Derazey violin includes: maple three-lobe oak leaf appliqués on corners of back; abstract foliate spear-shaped appliqué surrounded by decorative purfling on upper back, below button; walnut, burn-shaded cherry, burn-shaded boxwood, rosewood, maple, and ebony marquetry scene of a castle on lower back, surrounded by pointed-arch-shaped purfling terminating in a purfled French cross with inlaid cherry trefoils at the ends of the arms; walnut, burn-shaded cherry, burn-shaded boxwood, burn-shaded maple, and rosewood rectangular marquetry town scenes within inlaid, brown-stained hardwood fillet, crossed line decoration on center ribs. 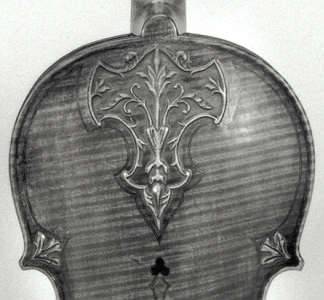 Purfling on the violin: double; inner band follows outline of carved and inlaid decoration; inlaid before appliqués affixed, which slightly overlap purfling. 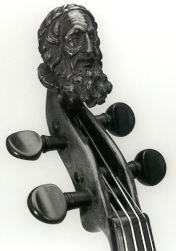 Pegbox of Derazey violin terminates in a carved head of an elderly, bearded man wearing an acanthus wreath and a ruff. Back of pegbox is flat, with incised and black-painted vine pattern and decorative cutouts.